How do I know if my baby has Down’s syndrome? If you’re about to become a new parent, this might be something you’ve tentatively typed in to Google. When you do Google it, within 0.39 seconds, over 41 million responses come up. The top 10 results are sponsored adverts inviting you to book in for the ‘Down’s syndrome test’. There’s a huge amount of confusing information out there and it’s difficult to find clear descriptions of the tests from independent sources. This article describes these tests in order to help you feel more informed about them and any decisions you make. Down’s syndrome is a genetic condition where you have an extra chromosome. Chromosomes carry our genes, the information that determines how we develop. Normally, chromosomes come in pairs but in certain conditions there is an extra third chromosome, this is known as trisomy. Down’s syndrome is also known as trisomy 21, because there are three (instead of two) copies of chromosome 21. About one in 1000 babies is born with Down’s syndrome. The chances of having a baby with Down’s syndrome go up the older you are when you become pregnant. A child with Down’s syndrome will have a learning disability, though it’s not possible to know how much this will affect the child. Some of the things they may struggle with are communication skills, reading and writing, and learning new things. These difficulties can be mild or more serious. People with Down’s syndrome are also more likely to have problems with their heart or digestion. Much more is known about Down’s syndrome now, and there’s more advice and support available to help children learn and live independently when they are older. What are Edwards’ syndrome and Patau’s syndrome? There are lesser known chromosomal abnormalities that cause more severe health problems. Edwards’ syndrome is also called Trisomy 18, and Patau’s syndrome is also known as Trisomy 13. Babies with these conditions have three copies of chromosome 18 and 13, respectively. Edwards’ syndrome and Patau’s syndrome are much rarer than Down’s syndrome. Edwards’ syndrome happens in about three in 10,000 births and Patau’s syndrome occurs in about two in 10,000 births. The chances of having a baby with one of these conditions go up the older you are when you become pregnant. Babies who have these conditions have heart problems, growth problems and brain abnormalities. Most babies that are born with these conditions are too poorly and die before or soon after birth. They rarely survive beyond the first year of life. What are the screening tests for these conditions? Your antenatal team will offer you the screening tests for Down’s, Edwards’ and Patau’s syndromes, but it is your decision whether to have the test or not. Some people want to screen while other people prefer not to. Everyone has different beliefs and it’s important to think carefully about what the results will mean for you if you decide to have the test. A screening test isn’t the same as a diagnostic test. It’s important to understand the difference so you can choose whether or not you want to have the tests. A screening test aims to identify if your baby is at high risk of one of these three chromosomal abnormalities. If this test is positive, you will be offered a diagnostic test. This is a test that can say for definite whether or not your baby has one of these conditions. There are three screening tests for Down’s, Edwards’ and Patau’s syndromes. The combined test is a blood test which looks at the levels of two blood markers (Papp-A and HCG) combined with an ultrasound test that measures the thickness of the nuchal pad (a pocket of fluid) at the back of the baby’s neck. This test is done between 11 and 13 weeks of pregnancy. This test aims to work out the risk of your baby having Down’s, Edwards’ or Patau’s syndrome. You can choose to screen for any one or all three of these conditions. Depending on the results, your doctor may advise you to have the quadruple test before considering having a diagnostic test. The quadruple test is a blood test that screens for Down’s syndrome. It looks at the levels of four blood markers (AFP, beta HCG, inhibin-A and oestriol). The test measures the levels of these markers to indicate if there’s a high risk of your baby having Down’s syndrome. The test is usually done between 15 and 20 weeks. If the results show that there is a high risk, your doctor will have a conversation with you about what this means before you consider going on to have a diagnostic test. The DNA test is a blood test that screens for Down’s syndrome. It analyses DNA fragments in your blood (this is called cell-free DNA). The test aims to find out if there is more chromosome 21 in the DNA than is normal. Examples of this test include Harmony, Verfi, Panorma Test, and Maternity21P offered by private clinics. The NHS does not routinely offer the DNA test at the moment (unlike the combined test and the quadruple test). Research is still being carried out to decide whether to make the DNA test available or not. The results of the DNA test give you an indication of the risk of your baby having Down’s syndrome. 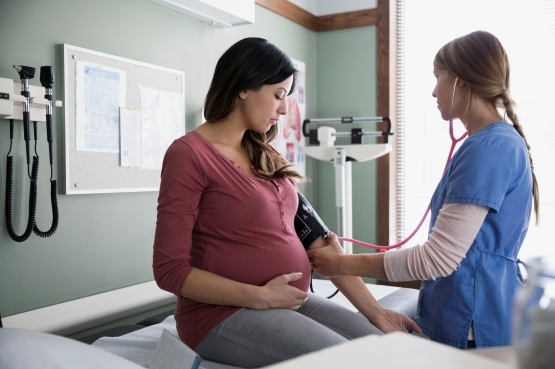 If the results are positive (your baby is at high risk), your doctor will explain more about what this means and answer any questions you have. You might then consider whether or not to have a diagnostic test. It’s important to remember that screening tests can’t tell you whether or not your baby has Down’s, Edwards’ or Patau’s syndrome. A low-risk result doesn’t mean your baby doesn’t have an abnormality; equally, a high-risk result doesn’t mean that your baby does. That’s why, if you choose, you can go on to have a diagnostic test. Diagnostic tests are only offered if you have a high-risk result from your screening test. This is because the diagnostic tests come with some risks that you need to think about. One in 100 women who have these tests may have a miscarriage. There are two tests that can provide a diagnosis for you. Chronic villus sampling. In this test, your doctor will take a sample of cells from your placenta. These cells are tested for specific signs of Down’s syndrome and other chromosomal abnormalities. Amniocentesis. In this test, your doctor will take a sample of amniotic fluid (the fluid around your baby inside your womb). It will be tested for the chromosomal abnormalities. It’s a good idea to discuss all the options and choices with your doctor, partner and family. While the decision is up to you, it’s not one you have to make alone. Getting support, information and advice will help you decide what is the best option for you. Bupa doesn’t offer these screening or diagnostic tests, but your GP and antenatal care team will talk to you about the tests and how you want to proceed. A miscarriage is the unexpected loss of a pregnancy during the first 23 weeks. It happens in about one in four pregnancies. You’ll be offered ultrasound scans throughout your pregnancy to monitor your baby's growth and check that everything’s going well.